The Great American Beer festival is not only about sampling quality beer but is also a beer competition. Breweries enter their beers to be judged by the festival’s Professional Judge Panel. Festival attendees can also sip the beer entered in the competition during the tasting sessions. The Great American Beer Festival invites industry professionals from around the world to sit together in small groups and, without knowing the brand name, taste beers in each specified style category. The ultimate goal of the Great American Beer Festival Judge Panel is to identify the three beers that best represent each beer-style category as described and adopted by the Great American Beer Festival. The Professional Judge Panel awards gold, silver or bronze medals that are recognized around the world as symbols of brewing excellence. These awards are among the most coveted in the industry and heralded by the winning brewers in their national advertising. Five different three-hour judging sessions take place over the three-day period during the week of the festival. Judges are assigned beers to evaluate in their specific area of expertise and never judge their own product or any product in which they have a concern. See Beer Styles for the Competition Style Descriptions and Specifications. 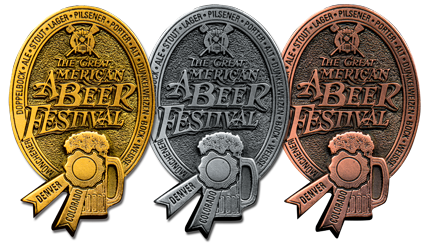 The Great American Beer Festival awards gold, silver and bronze medals for excellence in 102 beer-style categories but does not necessarily award medals to the top three finishers in a particular category. When judges decide a category contains three excellent examples of the style, they award gold, silver and bronze medals for the first, second and third place beers, respectively. If judges believe that no beer in the category meets the quality and style-accuracy criteria, they may elect not to award a medal. Judges may award a beer with a silver or bronze medal and yet not award a gold medal. Gold A world-class beer that accurately exemplifies the specified style, displaying the proper balance of taste, aroma and appearance. Silver An excellent beer that may vary slightly from style parameters while maintaining close adherence to the style and displaying excellent taste, aroma and appearance. Bronze A fine example of the style that may vary slightly from style parameters and/or have minor deviations in taste, aroma or appearance.